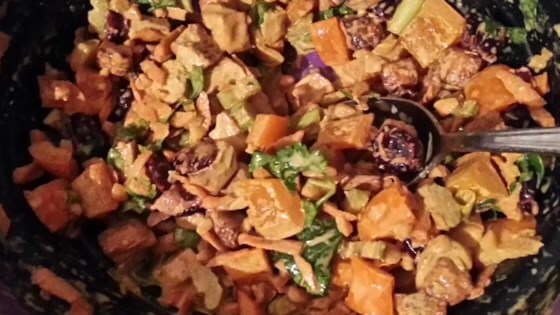 "A great vegetarian alternative to tuna or chicken salad. Sweet and spicy!" Preheat an oven to 350 degrees F (175 degrees C). Place tofu on a lightly greased baking sheet. Bake tofu in the preheated oven for 25 minutes, stirring halfway through the cooking time. Remove tofu from the oven and allow to cool. Mix curry powder, lemon juice, mayonnaise, vinegar, red pepper flakes, and soy sauce in a small bowl. Set aside. Combine tofu, carrots, red pepper, peanuts, dates, garlic, and green onion in a large bowl. Top with sauce and mix thoroughly. Chill for an hour before serving. Delicious!! I ate it wrapped in a flour tortilla. Would give this a 4.5 if I could. Nice side to a main Thai dish.